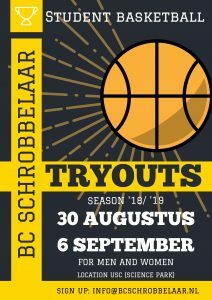 Are you interested in playing basketball at BC Schrobbelaar? Click here to sign yourself up for the try outs for 2019-2010! 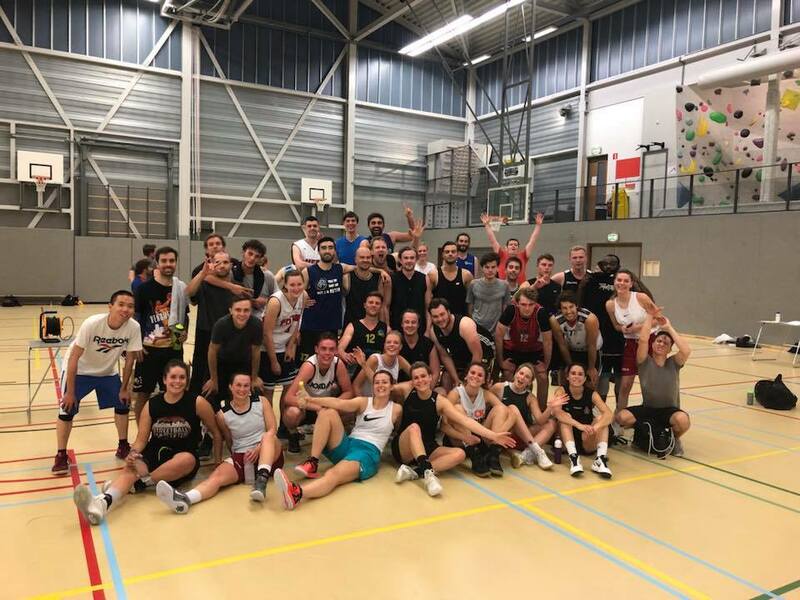 Meld je hier aan voor de try outs voor het seizoen 2019-2020. Looking for new members for the season 2018-2019! February 23, 2018 by bcschrobbelaar·Comments Off on Looking for new members for the season 2018-2019! For the season 2018/2019 we are looking for new members! 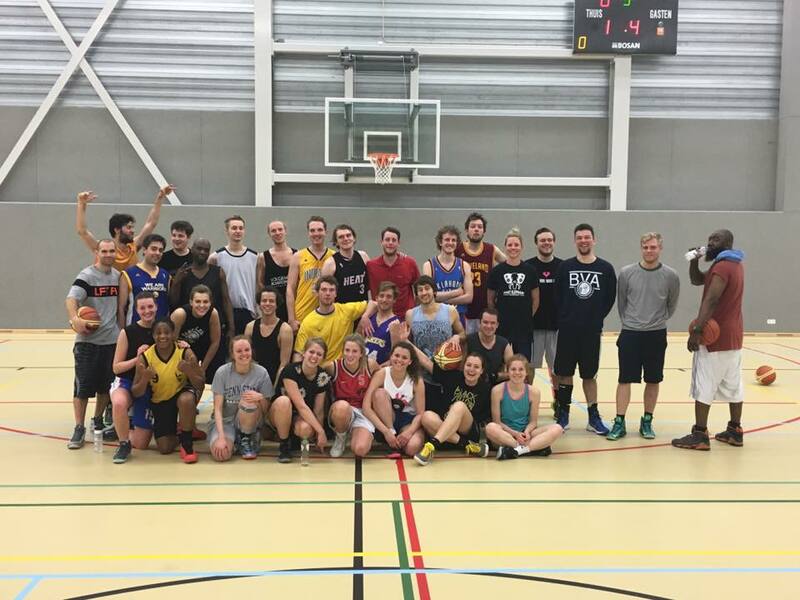 Do you already have basketball experience and are you a student, looking for a new club? Send Amber an email at ledenadministratie@bcschrobbelaar.nl for more information. For the ladies: at the moment we only have one women’s team but next year we are creating a new, second women’s team. Dames 1 will play in 1e klasse A; Dames 2 will play in 2e klasse A. If you are interested in playing in one of the teams please let us know! Hope to see you soon @ the court!! On September the 7th, we’ll organize a try-out for all new male members @ USC Universum, 19:30 (sorry, our women’s team is full). If you’d like to join, please send us an e-mail: ledenadministratie@bcschrobbelaar.nl. After the try-out, the board will assign everyone to a team. We will update you within a two-day notice. 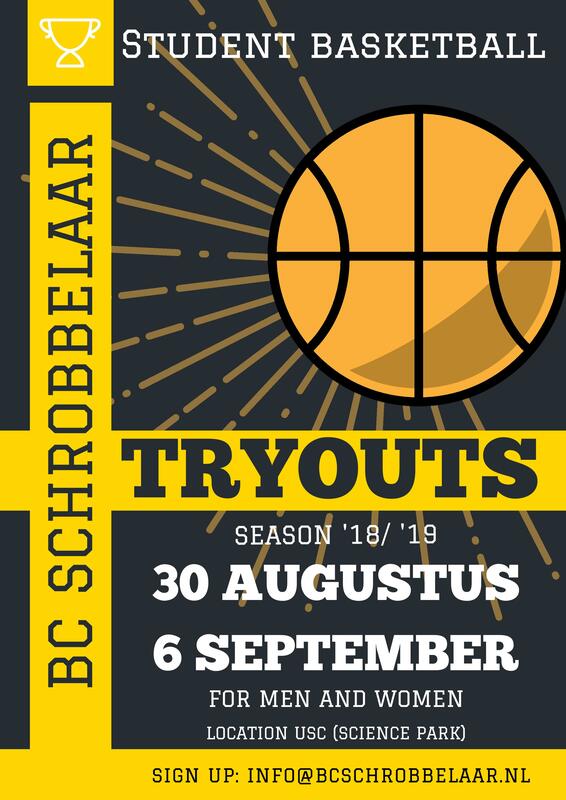 We are sorry to say that in case we have too many new potential members, the ones that cannot be assigned to a team, cannot join BC Schrobbelaar for 2017-2018. May 11, 2017 by bcschrobbelaar·Comments Off on Looking for new members! Are you a (new) student in town and have you played basketball before? Then we are looking for you! For next season (2017-2018) we are looking for new men players. We’re sorry, our women’s team is full at the moment. 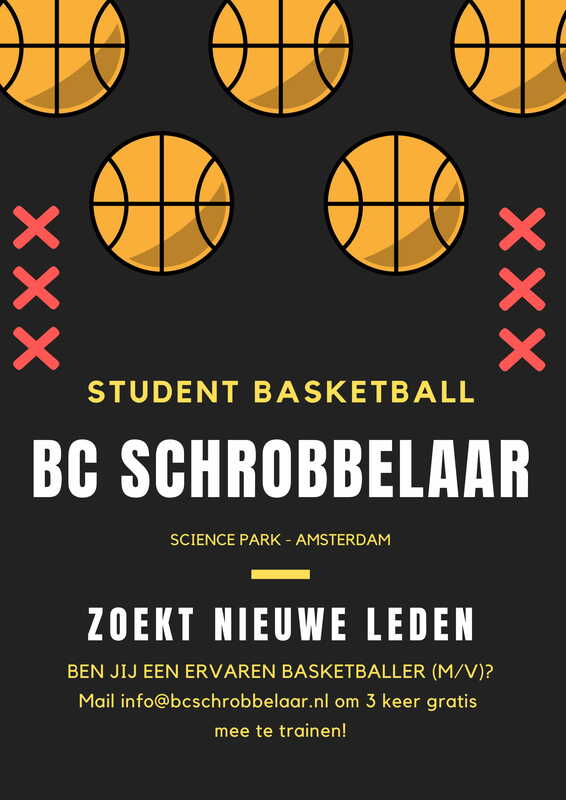 Please send us an e-mail if you are interested (info@bcschrobbelaar.nl), inform us a bit more about your basketball skills and we’ll invite you to our practice sessions. On the 29th of April, we organize our end of the season tournament! Everyone that at least played some basketball before is welcome. Costs are 5 euros and you can subscribe by sending an email to info@bcschrobbelaar.nl.